Original tape date: February 22, 2013. First aired: June 11, 2013. U.S. Congressman and mayor of New York from 1978 - 1989, Mr. Koch stayed relevant in the world of politics until the day he died. In this CUNY TV Special, "Remembering Ed Koch," we gather together several members of Mr. Koch's weekly "lunch club" to reminisce about the charismatic figure's accomplishments and setbacks over his storied career. Joining moderator Sam Roberts of "The New York Times" for a lively conversation over one of their favorite meals are guests George Arzt, Peter Aschkenasy, John LoCicero and Peter Piscitelli. 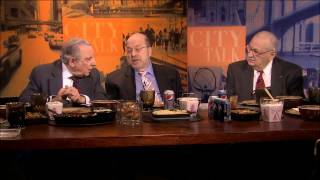 Members of the Ed Koch Luncheon Club talk about the late mayor's thoughts of suicide.